This program focuses on Agriculture for food security, climate change, economic diversification and income generation, food / chemical transformation, entrepreneurship development, insertion and reinsertion of women and girls. 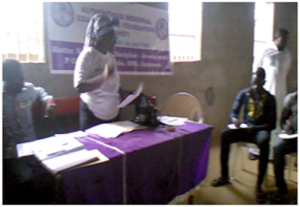 As a follow up of sensitization campaign for youths carried out in January, the P2 head and her team dedicated the month of March on the ground preparation for the upcoming training in April 4th-6th 2018 on the theme: Empowering Women and Youths in the context of crisis: Sensitization and training workshop on Poultry Farming, Urban Agriculture and Waste Paper Recycling. 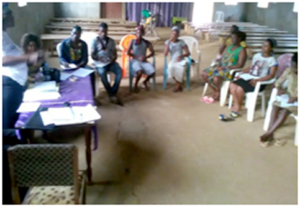 The overall objective is to empower women and youths economically to enable adaptation in the present context of crisis. A radio talk on the Ocean City Radio 88.5 in kumba relaying the importance of the training to the residence in kumba and its environs. 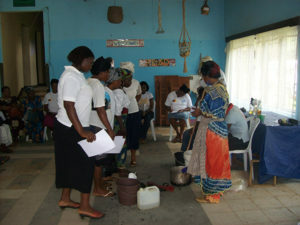 AMEF women learning how to locally produce soap and omo which could be used for home consumption and possibly for commercialization. – They equally learned and produced other items like body lotion. 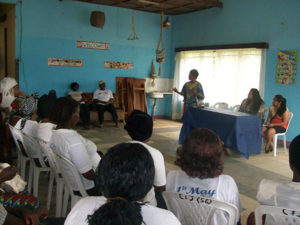 With the aim of identifying alternative ways of engaging women and especially youths in entrepreneurship development, balancing farm and non farm activities for youths who do not yet see agropastoral activities as a form of livelihood, the AMEF-ACTIVE FINGERS INITIATIVE program was formed; through the recycling of waste papers into jewelries, hand bags, flower jars, table mats etc.